What Could Have Made Cinco de Mayo Better? It’s been 10 days since Cindo de Mayo and I can’t help but reflect on that days events. The day was filled with laughter, beer, friends, and of course, nachos. But what could I have done better? What could have enhanced my overall Cinco de Mayo experience? The answer rests in the Heated Nacho Tray. Gizmodo.com tempted me to with this powered nacho accessory, yet I still didn’t buy one. I must have had a momentary lapse of intelligence. What could be better than having beer after beer, all the while knowing the my nacho cheese would be kept at a perfectly delicious temperature? 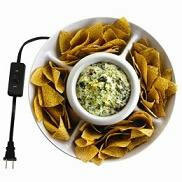 So check it out, the Heated Nacho Tray is a winner in my book and is a must-have accessory for every nacho lover. 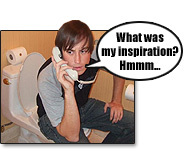 Author Joe Brian and StevePosted on May 15, 2007 Categories Opinions2 Comments on What Could Have Made Cinco de Mayo Better? Sarah and No Name from Alice @ 97.3 generously invited us to their Cinco de Mayo (Thizzo de Mayo) broadcast to judge their “Battle of the Bay Taco Licking Contest.” And although nacho cheese wasn’t involved, we graciously accepted the challenge. The contest consisted of two teams of three: The North Bay vs. The East Bay. It was a hardfought battle, but after all the tongues were tired and all the tacos were licked, the North Bay team was crowned the victors. Overall, the entire event was great to be part of. Hooman was sporting an ILoveNachoCheese.com shirt, we got to hang out with the morning crew again, and we were able to meet some interesting loyal listeners. Even recently engaged Andrew “The Bachelor” Firestone showed up to drink and be merry! We recently wrote a post about a fight that broke out between two girls at Revere High School over nachos. While police never elaborated on the circumstances, only to disclose that they were both arrested for assault and battery, there have been a few stories written about the scuffle. Brilliant, Susie. We couldn’t agree with you more. If you think about it, your instruction should really be nacho common sense… but then again, so should mindful one-for-one car merging during traffic. 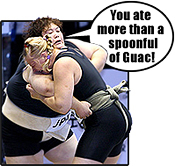 But it only takes one halfwit to stir up roadrage, or in this case, a nacho brawl. The word Emo is short for “emotional”. It represents a type of music, personality, and fashion. Typically Emos are very sad and angry. They like to have their hair in front of their face (to hide their tears?). 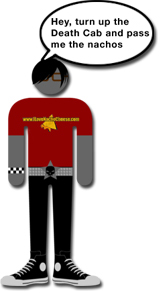 Emos like to wear old and beat up clothes (to conform to non-conformity?). Usually they are very shy and introverted (ashamed of their stupid hair?). Emos also listen to music with themes of confusion, depression, and loneliness (ashamed of their stupid hair?). So what do Emos do to help hold back the tears and avoid their dark eyeliner from running? No, they don’t use waterproof eyeliner. They EAT NACHOS! Last month, we posted a story on a patent for a microwavable nacho box. Shortly after, the inventor, Kim Y. Edomwonyi contacted us. During a quick conversation, we learned that Kim currently lives in the midwest in a small town in the southeastern tip of Iowa. Originally from Atlanta, GA, Kim never intend to stay but it’s “comfortable, with no traffic, less stress, and safer” than the big city. But what inspired Kim to become an inventor? And furthermore, what was the inspiration behind the microwavable nacho box? We were able to conduct a quick interview with Kim to find out the answers to these questions. Ever wonder about the word “nacho” and what its origin may be? Adriana P. Orr, former U.S. library researcher for the Oxford English Dictionary, wrote an article back in 1999 that tackled that very question. She recalls a day back in September of 1988 when a slip of paper with the word “nacho” was given to her from one of the editors. It was her job to research its etymology. However fascinating this magical quote was, she was never able to conclusively find the true origin. Everyone loves nacho cheese, right? Wrong! We live in a crazy mixed up world where there are actually people out there trying to spread propaganda against the beauty that is nacho cheese. We have found one such individual and feel an obligation to the nacho cheese community to identify the enemy. In an article entitled, “Behold the Evils of Cheese” posted on Visionary Darkness, a cheese-hater going by the alias Killing Joke entertains the notion that cheese is an evil force that’s taking over America. Don’t let this writer’s name full you. He is anything but joking. Make no mistake, Killing Joke is on a mission to rid the world of this wonderfully delicious gooey elixir. Considering the diet industry is big business and pulls in billions of dollars each year, it’s not surprising that there are so many out there. From Atkins, to The Zone, to South Beach, choosing the right diet and sticking with it is something many people struggle with each day. Needless to say, being a nacho lover doesn’t really help the cause. The Watley Review posted a parody article about a research study that proposed the effectiveness of the Tourette’s diet, also known as the “nacho diet.” (Is it just me, or does anyone else have a strong urge to cuss right now?) The study, funded by Frito-Lay’s, was conducted over a two-year period and is the first to document a positive affect on the American physique by a snack food. Participants consumed one serving of nachos in place of breakfast and lunch, had a normal dinner, and were allowed snacks consisting of fruit. Participants lost up to 8 pounds in two weeks! 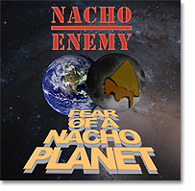 And while The Watley Review may be a parody site, and this “diet” may not be a good idea to actually undertake, we believe in a perfect world, the “nacho diet” would be A-Okay! GDC2007 has come and gone. Overall, it was a decent show…albeit, one without nachos conveniently available in the convention center. However, in response to this post, Michael Fahey over at the gaming mega-blog Kotaku generously wrote us with this report. According to Fahey, Telltale Games held a small party to promote their upcoming Sam and Max game. The shindig was held at a little speakeasy in a Union Square alleyway and was home to many drunk members of the press as well as Steve Purcell, the creator of Sam and Max. But the big news of the night was that they were serving up nachos. Fahey described them as being “slightly thicker than your normal variety, with some of them bordering on the chewy side for some odd reason.” He added that, “while the other finger foods were down at the other end of the darkened bar, the nachos sat alone upon a pedestal, piled high…piled proudly.” He admitted to spending a fair amount of time standing next to the pedestal, scooping up copious amounts of goodness onto the slightly sweet chips before eventually breaking down, grabbing a plate, and shoveling a large chunk out of the diminishing pile and carrying them over to a table where his Kotaku cohorts and friends waited. We salute you, Michael Fahey, for keepin’ it real and being a proud nacho cheese lover!